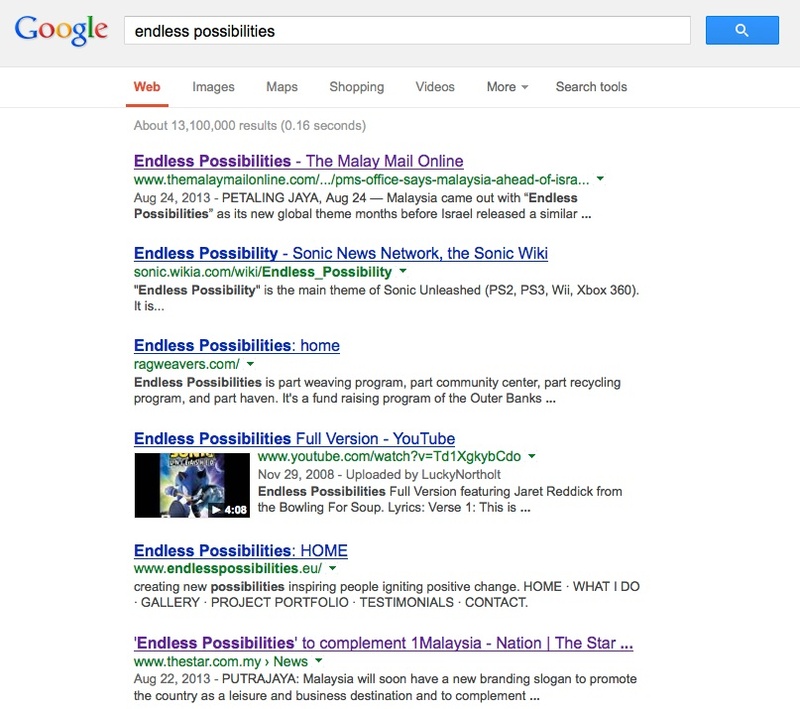 On the 5th September 2013, I reported that the newly developed tagline for Malaysia “Endless Possibilities” would not be used. You can read the full story here. The official launch was supposed to be on 17th September 2013 but this has now officially been ‘postponed’. This is a hugely embarrassing situation. This process began in December 2011 and the new tagline was given its first outing by the Tourism Ministry in Dubai in 2012. It was due to be launched officially on 17th September 2013, almost two years after the project was initiated. You only need to read this blog or those of any other destination branding experts to know this is not the way to build a destination brand. So what can we learn from this nightmare? 1)	If I’ve said it once, I’ve said it a thousand times, YOU CANNOT DEVELOP A TAGLINE AND THEN RETROFIT A BRAND AROUND THAT TAGLINE USING ADVERTISING AND PROMOTIONS. It is a fundamental of branding. If you are responsible for developing a Nation Brand you must understand this. I don’t care if someone gives you a tagline and tells you to build a brand around it. It simply is not possible and you have to stand your ground. 2)	A tagline is not a brand. Let me say it again, A TAGLINE IS NOT A BRAND. Too many taglines have made promises the Nation couldn’t possibly keep, have left potential customers underwhelmed, have been lost in the clutter of advertising noise or have been ruined by an event beyond the control of the Nation. Moreover, we live in a social economy. What is the first thing a prospect will do when he hears a tagline? He will look to the Internet to find out what is being said about the country. If he sees more negativity than positivity, he’ll believe what others are saying, not what the Nation says. It won’t matter how much you spend on corporate driven messages pushed out across mass media that try to convince him otherwise. 3)	Ask yourself how many great ads you remember from yesterday or the day before. Not many, right? Even those in the industry find this a tough question. There is so much advertising noise that it is very hard for a campaign to be seen, let alone remembered and acted upon. There is a place for advertising countries, but not for using advertising to gain traction for the brand. 4)	Just because you hire a research company to do your research, doesn’t mean you’ll get the right research. And if you are starting with a tagline and trying to retrofit your brand around that tagline, your research is going to be flawed before it even starts. After all, how can you develop the right research methodology if you are starting from the wrong place? 5)	If you insist on starting with a tagline, Google it first before you do anything. A Google search of “Endless Possibilities” throws up 13 million results including destinations that have already used it – Mongolia, Israel, Sagada, corporations – BHS India and conferences, t-shirts, singers etc. Every stage of every element of any brand development should be checked and double checked again. There are other, more specific lessons that can be learned from this issue but there is nothing to be gained by outlining them here. Let’s just hope that to avoid any more lost time and money, the project will now be carried out the way it should have been in the first place. And we pay millions for the consultants to make this stupid mistake. 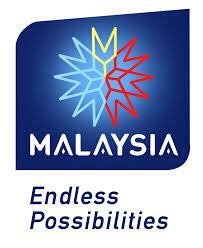 I don’t think it is ‘foreign consultants’ who are responsible for the Malaysia Nation Brand. This is my thought, usually clients already made up their their mind on what they want. You could give them millions productive suggestions. This one client asked me to design their website (an urgent job), with a particular audience, doctors. And they explained the characteristics of doctors (straight to the point and no distractions to name a few). So I gave them a few design proposals with the specific targets oriented and one of my colleague just gave one extra (very cluttered and poor design just for fun) with tweet posts, full of images and an ugly human head anantomy. And in the end they picked his design over mine, it was very frustrating. If i know their audience from what i was briefed, I know they wont even look at other nonsense designs, and I know it wont be as effective. But hey, they still pay. But still.. So they basically went totally opposite from what they wanted in the first place.. hmm.. Unfortunately too many clients expect the best possible quality creative work done in the shortest possible time and at the cheapest possible price. And quite often they make their final decision not on the opinion of the expert but on their own ego or opinion based on design. Design is important in many areas but it should not be the reason why a decision is made. I have a client now who needs a brand strategy developed but her decision will be made on our creative designs. Madness!! Yeah most people dont really understand design. art and design are two different things. just because something is beautiful doesnt mean its a good design. But clients always have the final say. I need to work on my persuasion skill i guess. I dont really blame them if i really think about it. some might be my fault for failing to convince them. Still a lot to learn I guess. post is very informative and easy to understand.